Days off request my favorite flavor, and therefore I present you Bill's delicious lemon bars , dead easy to make and with a filling that reminded me more of custard than curd; for a moment I thought of dusting the bars with icing sugar to hide the small cracks, but then I came to the conclusion that the idea went against what I believe: I don't think there's anything wrong with cracks in desserts - or lines in people's faces, for that matter. Lightly butter a 32x22cm (13x9in) baking pan*, line it with foil leaving an overhang in two opposite sides and butter the foil as well. Base: sift the flour, corn starch, baking powder and salt into a large bowl and stir in the sugar. Make a well in the center and add the melted butter and vanilla. Mix until evenly combined then press the dough into the base of the prepared pan. Chill for 30 minutes – in the meantime, preheat the oven to 180°C/350°F. Bake the base for 20 minutes or until lightly golden. Filling: sift the flour into a large bowl. In medium bowl, whisk together the cream, sugar and eggs. Add a couple of tablespoons of the egg mixture to the flour, whisking to dissolve it into the liquid (do that to avoid flour lumps in the mixture). Add the remaining egg mixture and whisk until smooth. Stir in the lemon juice, zest and vanilla. As soon as the base is golden pour the filling mixture on top and bake for another 20-30 minutes or until set. Cool in the pan over a wire rack. Cut into bars or squares and serve. I make it a rule to avoid any perfect-looking dessert. They don't usually taste all that good! These bars look fantastic. I am excited to try these bars with a custard feel to them. The photograph looks lovely, lines and all. oh my goodness..these look amazing..yep..i will be making 'em..oh..and i'm with you on the not so perfect look in food and people..i've let me hair go grey and it's so liberating! I adore lemon bars... heck I adore lemon anything. Yum! LOL...lines on people`s faces. These look fabulous. I`m a total lemon lover. MUST BAKE! i love how you mixed such a yummy recipe with music choices. so lovely! My Mom made this recipe for my birthday cake yesterday and BOY are these soooo good!! 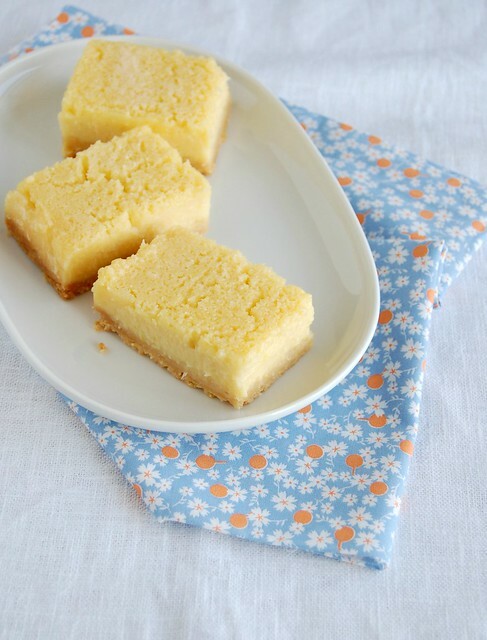 One of the best lemon bar recipes ever!! Marina, that is excellent news! Thank you so much for letting me know!